The first plans for a rapid-transit system in Baku date to the 1930s, with the adoption of a new general plan for the city's development. Having survived the Second World War without falling to the Germans, and, furthermore, becoming a strategic hub of the Caucasus, the population passed the one million mark, a requirement of Soviet law for allowing construction of a metro system. In 1947, the Soviet Cabinet of Ministers issued a decree authorizing its construction, which began in 1951. Delays, however, meant that it was not until 6 November 1967 that Baku Metro became the USSR's fifth rapid-transit system. The first 6.5 kilometers of track were inaugurated to coincide with the fiftieth anniversary of the October Revolution. The metro includes very deep central stations that could double as bomb shelters in case of a nuclear war attack - remember the metro was built at the height of the Cold War. 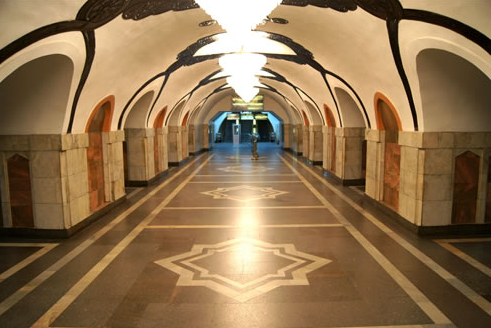 Often exquisite decorations featuring Azerbaijani national motifs are incorporated on platform walls and metro thoroughfares. 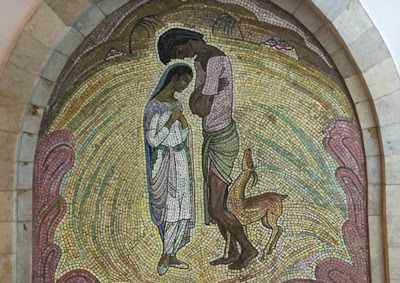 In particular, the mosaics at Nizami and Neftchilar stations, and the marble and copper work at Elmlyar Akademiyasy station, are well worth visiting. Presently, Baku metro's two lines are 34.6 km in length with 23 stations. About 560,000 metro rides are undertaken daily. (Baku's population is 3 million). Since independence, the country has seriously invested in the metro, opening new stations, sometimes with dramatic architecture. According to the city's development program, the length is projected to be 199 kms with 76 stations by 2030. Trains carriages from the 1980s are gradually being replaced with a modern fleet. The carriages, as well as platforms, are immaculate. Baku metro operates from 06:00 to 24:00 every day. It is not possible to buy a single ticket - the system requires a train card, which you purchase for around $2 and then load. A single fare anywhere on the system is 20 qepik, about 20 cents. Unlike the Almaty metro, it is regrettably not permitted to photograph within Baku's metro. Bravo to Baku for investing in public transport and for continuing the tradition of beauty in public infrastructure!